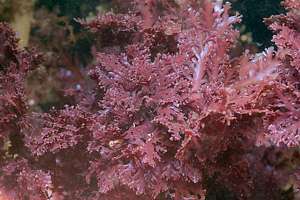 Red seaweeds are most suited to grow in dark places and in the deep. 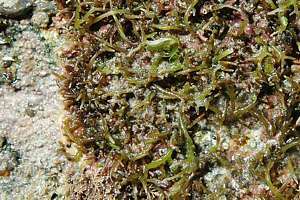 Yet many species survive well near the surface and in rock pools of the intertidal rocky shore. It is difficult to tell the various species apart. 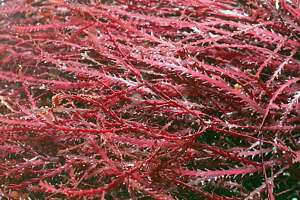 Many red seaweeds are intrically branched, forming beautiful patterns when spread out over a white page of paper. 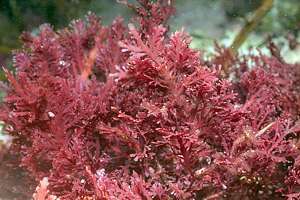 red seaweeds: Red seaweeds are finely structured, weak and suitable for deeper waters. Buy our CD or make a donation. 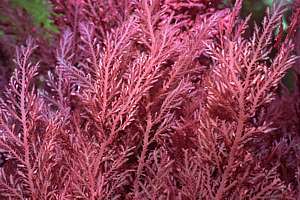 Red seaweeds have a red pigment that absorbs blue light, which penetrates deepest in the sea. 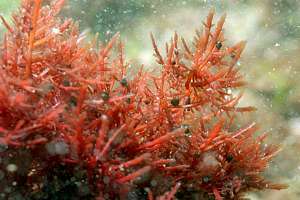 As a result, red seaweeds can be found deeper than brown and green seaweeds. 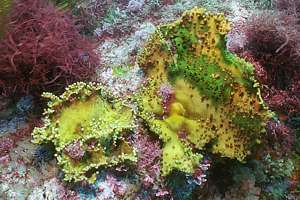 But even in the sunlit shallows of the rocky shore, one can find a number of species. 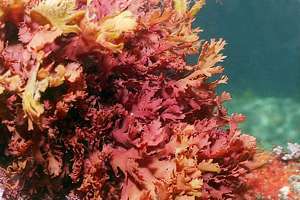 The red seaweeds comprise the largest number of seaweeds in New Zealand. (Porphyra columbina) [karenga] looks like tissue paper. It flourishes in winter and spring. Small plants fold like a rosette. 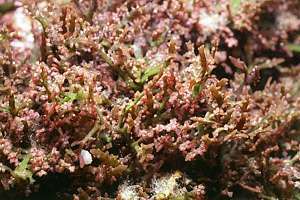 Apophlaea sinclaiirii is a dull brown-red rubbery alga that grows flat over the rock or extends tiny rubbery fingers. It dries rigid and black like tar but swells when the tide is in. Apophlaea lyalli grows up to 18cm on high tidal rocks of the southern South Island. Branches rounded, dark red and bushy with firm texture. 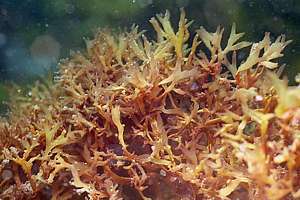 0703060: blood crust (Ralfsia verrucosa) forms a brown to deep red wrinkled crust, surviving extreme desiccation. 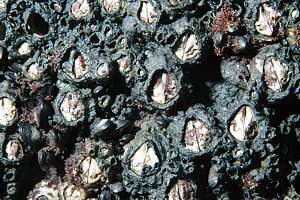 the barnacle is the sheet barnacle or modest barnacle. 0608219: a crusting red seaweed looking like black goo. 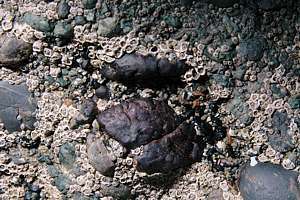 Gelidium pusillum (1-2cm) is a brown to black mat growing in between barnacles. 0703019: moss weeds on a vertical wall in relative shelter. 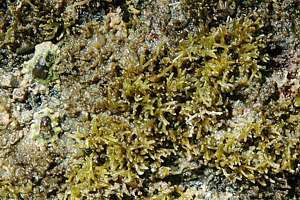 0703021: the moss weed (Gelidium caulacantheum?) from the photo on left. It feels like moss, dense and bouncy. compare size with the modest barnacles on right. 0703032: ?. Also which are the two limpets on left? 0703027: ? 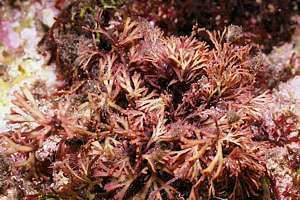 Gelidium caulacantheum a turfing small red seaweed that feels firm and bouncy. Bryocladia ericoides (2-8cm) has small erect stipes with short spiny branches (like pine trees or heather), forming dense mats that are stiff in texture. south from Cook Strait. Strictosiphonia spp. (up to 5cm) has tufted, rolled branch tips that are firm and springy. Brown to dark purple, a spongy tufted plant in the barnacle zone. 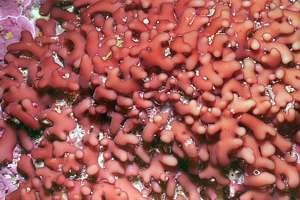 Helminthocladia spp. form cushions (15mm high) with tiny, tightly packed cylindrical stipes. Very firm and erect like tiny pin-cushions. 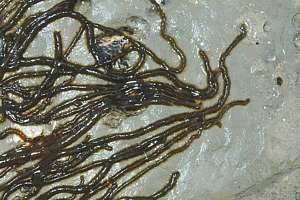 Laurencia thyrsifera has cylindrical stipes branching in a flat plane. The ends of side branches resemble tiny clusters of grapes. Green-red. f051219: ? Champia sp.? f038114: the iridescent-blue red seaweed (Champia laingii) has stubby round branches and rounded endings. f034114: the finely branched Pterocladia lucida branches in a flat plane. 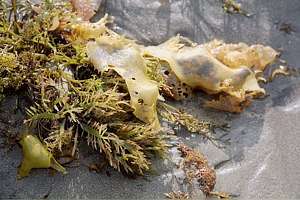 From this seaweed the agar gelatine is made. Agar is used as a stiffener in foodstuffs, toothpaste, soaps, shampoos etc. It is also used scientifically to grow bacteria on. 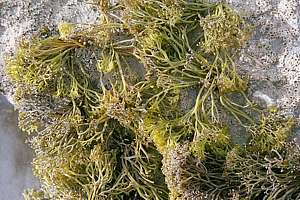 0910044: Pterocladia capillacea is a creeping alga with thin stems with tufted branches. It prefers to live under water. 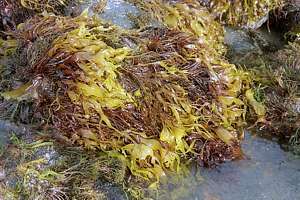 This seaweed is also suitable for making agar. 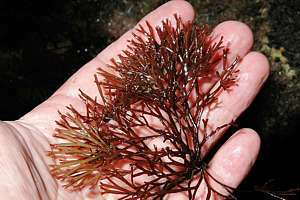 Pterocladia pinnata is a fine, sparsely branching feather-shaped red seaweed. Plocamium microcladioides (up to 15cm) has firm cylidrical stipes that branch in one plane. Terminal hook-like branches in sets of three on the same side of the blade. Lower intertidal. Polysiphonia decipiens is the most commonly found of this genus. 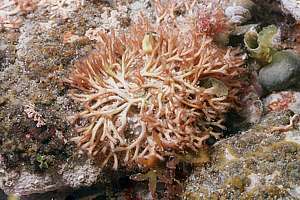 It is highly branched with no obvious stipe and covered with pigmented hairs. 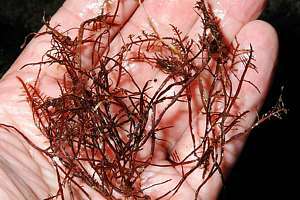 It has a soft texture and dark red-brown colour and sometimes grows on brown seaweeds. Rhodymenia novazelandica has a fine, open fan shape, branching dichotomously in one plane. Red. 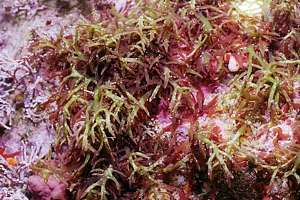 f051727: a hard red seaweed growing out from a central clump (Apophlaea sinclairii). f051729: finely branching (Plocamium costatum) in the background. In the foreground Melanthalia abscissa? f051725: (Callophyllis variegata?). f051728: ? f051229: ? f051211: the fretsaw weed (Vidalia colensoi, Osmundaria c.) with alternating teeth is found in robust wave action. 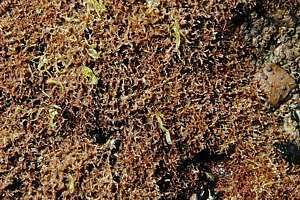 It does not feel slimy but rough and can grow to dense patches. North Island. f051213: Laurencia thyrsifera? f032523: Pterocladia pinnata? f051215: Melanthalia abscissa? 0703037: Melanthalia abscissa? dichotomously branching flat, thin stems. f222613: Pachymenia lusoria has long flat blades that look green, sprouting from thin stipes clustered from a single holdfast. Blades have jagged edges. West coast of the North Island and South Island but rare in central NZ. f051507: a robust green looking leafy carrageen Gigartina circumcincta, growing flat in exposed conditions. 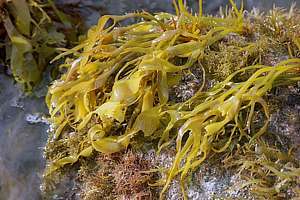 The name carrageen comes from an edible Irish seaweed, the Irish moss. f222610: . West Coast NI. f222607: parsley weed (Gigartina alveata). West Coast NI and SI. 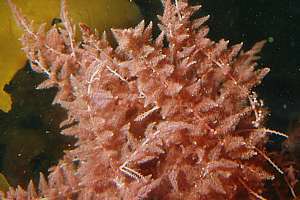 Gigartina chapmani (6-7cm) is a gelatinous red turfing alga with cylindrical to flat fronds that branch irregularly feather-wise. Gigartina clavifera (15-20cm) has flattened splitting fronds that are tufted and bushy at their ends, branching in a flat plane. Gigartina decipiens (20cm) has thick, tough, flattened fronds branching dichotomously into 'v' type ends. Reproductive plants have tiny club-shaped structures around the edges, making them look frilly. Flattened blades ending in a 'v'. the prickly weeds (Echinothamnion spp.) have regularly branching, bushy and shaggy branches of unequal length. 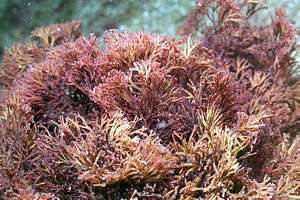 Reddish brown, sometimes growing on other seaweeds. Southern half of NI, all of SI. f048222: a healthy seaweed garden at the Poor Knights islands shows a high variety of seaweeds against a backdrop of an Ecklonia kelp forest. 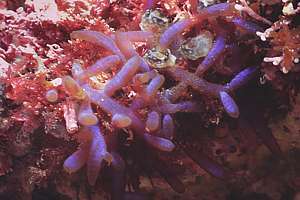 From left to right: stalked kelp (Ecklonia radiata), hugged by strap kelp (Lessonia variegata) and beneath it pink paint. 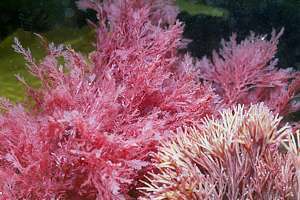 The red seaweeds are (Rhodophyllis membranacea?) and the broader leafed (?). The tall bladderweed looks like the featherweed (Carpophyllum plumosum) but is in fact (Cystophora platylobium). Such seaweed gardens can be found inside large rock pools. 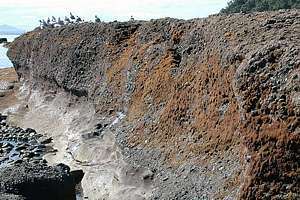 f210512: an exposed South Island rock pool shows the dominant species. From left to right: the sheltered form of bullkelp (Durvillea antarctica), the long strings of giant kelp (Macrocystis pyrifera), the hardy cartilage weed (Xiphophora gladiata) and in the middle of the water the spiky-leafed (Echinothamnion sp.?). f027103: a fine example of a semi-sheltered shore near Dunedin: From left to right: the giant kelp (Macrocystis pyrifera) with its thin leaves, the branching bullkelp (Durvillea willana), the hardy cartilage weed (Xiphophora gladiata) and the featherweed (Carpophyllum plumosum).